Starrett Micrometers have been the favorite micrometer of many machinists and engineers dating back to the 1800's. My Great Grandfather used a Starrett micrometer and now I have that same micrometer in my toolbox! The Starrett name carries a tradition of quality and excellence that makes Starrett Micrometers the first choice with the latest generation of Quality Professionals. Made in the USA. 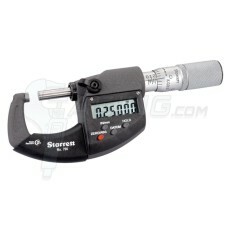 Starrett 796 Series Electronic Micrometers provide an IP67 level of protection against coolant, wate..